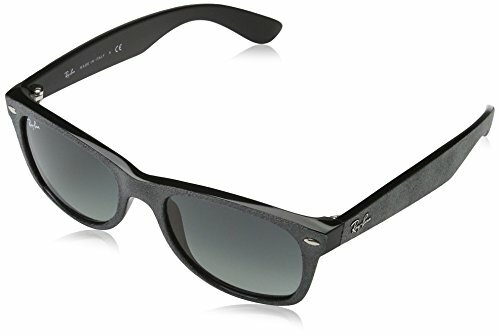 Ray-Ban Women's New Wayfarer Square Sunglasses, Black/Top Grey Alcantara, 58 mm | What Should I Say? Unisex square shaped new wayfarer frame in metallic grey. Cool grey gradient lens with option to rx. A new spin on an iconic look. The new wayfarer takes cues from the original with a smaller frame and slightly softer eye shape. Stay classic with a Ray Ban New Wayfarer.